And while hundreds of sports stars and clubs made the long list, the final four have been decided and we can reveal that St Johns’ all-conquering minor footballers and hurlers, Commonwealth super bantamweight champion Carl Frampton, Lámh Dhearg’s minor footballers and the Northern Ireland senior netball team will all go head-to-head for the prestigious award. The last 12 months have been remarkable for our gifted quartet. Lámh Dhearg got the ball rolling at the start of the year when their gifted minor football panel became the first Antrim winners of the Ulster Minor Club tournament at St Paul’s since the host club lifted the title back in 1986. Jointly managed by Frankie Fitzsimons and Terry McCrudden, the Hannahstown squad was tested to the limit by the province’s finest as well as the elements. A string of cancelled fixtures, due to the freezing weather, meant the Lámhs had to be on top of their mental game and, after showing tremendous character to reach the decider in late January, they were forced to dig deep into their reserves to edge out Rossa, Magherafelt in the final. A narrow 0-09 to 0-08 win was just reward for the Antrim champions. The youth of Lámh Dhearg were not the only Antrim Gaels to shine this year as St Johns’ minors displayed their strength in both codes by clinching the Antrim Championship double. Equally as impressive were the performances of North Belfast’s Carl Frampton, who showed just why he is being touted as the rising star of Irish boxing. 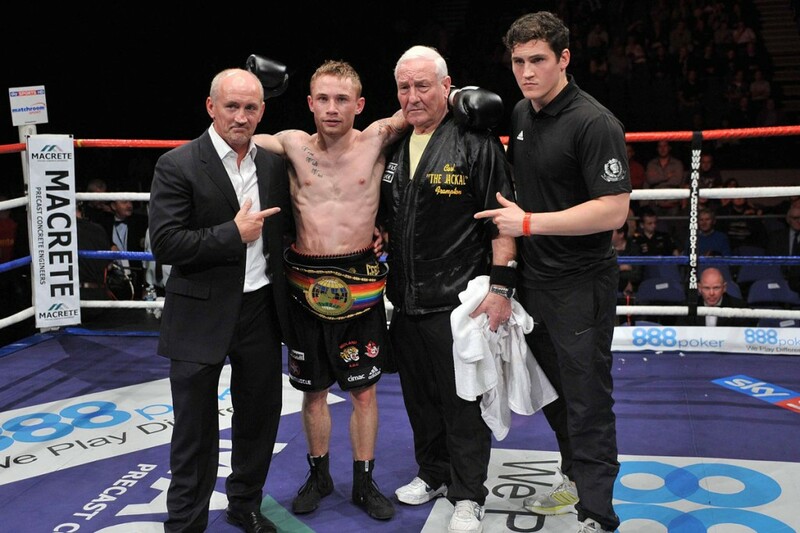 ‘The Jackal’ moved another step towards a future world title shot with a sensational display at the Odyssey Arena in September to land the Commonwealth super bantamweight title. Australia’s Mark Quon was stopped early in the fourth round of that bout as Frampton, a former Midland ABC amateur, extended his unbeaten professional record to 11-0. Having risen from 19th to 12th in the world over the previous 18 months, the Northern Ireland netball team had a highly successful 2011. Although agonisingly pipped for second place at April’s European Championships held at Antrim Forum, the girls in green made history at the Netball World Cup in Singapore in July as Northern Ireland reached the quarter-finals for the first time. Having beaten Sri Lanka and lost to holders Australia, NI shocked ninth seeds Samoa 66-37 in the crunch group game. They lost heavily to England in the quarter-final but came close to clinching a top six finish when edged out 46-41 by South Africa. All in all it has been an exceptional year of sporting endeavour by our quartet. It’s up to you to decide who should get the nod for the Sean Graham Aisling Award. It has been a testing job whittling down the nominees but Belfast Media Group Sports Editor Conor McLoughlin feels the four nominees’ unique exploits rose above the rest. “Once again our sports stars and teams have excelled and, as ever, we had a huge headache whittling all the nominations from our readers down to the final four,” said Conor. “But we feel we have a great mix of talent on the voting form.